In my last Linkedin article, I wrote about the importance Splendor puts on thought out, quality content with maximum impact over a high quantity of sub-par material when measuring the value of our services to a potential client. We continually find that when businesses resort to a “quick and cheap” fix, the results are rarely strong. It’s not to say that the correct answer to conducting a successful marketing plan is shelling out as much money as possible. And while I usually shy away from giving clients direct quotes on pricing (there are so many variables that impact a proposal), I’ve constantly tried to find a way to ballpark. 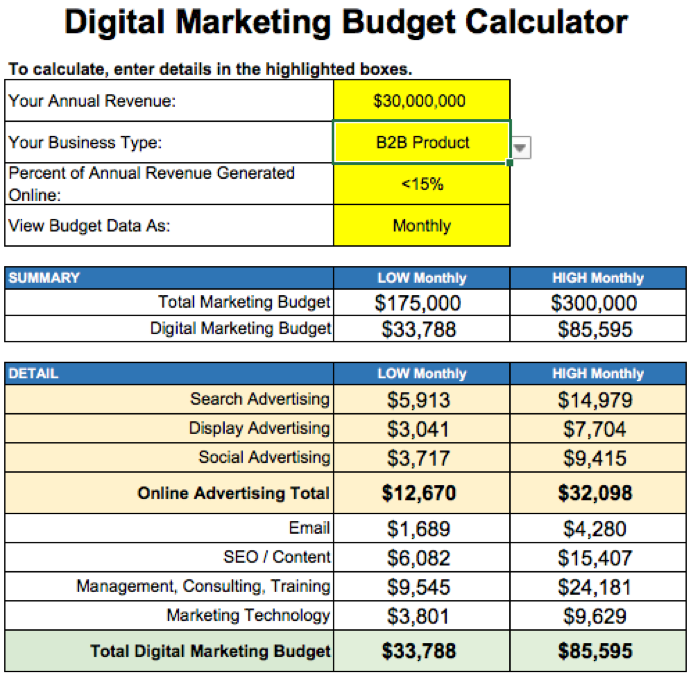 I recently stumbled upon a digital marketing calculator from a group called WebStrategies Inc. (download here). The developer, Chris Leone, has graciously allowed me to write this post about the tool. Chris developed the pricing calculator through the data of multiple resources; the latest research and surveys from CMO.com, Forrester Research, and eConsultancy. 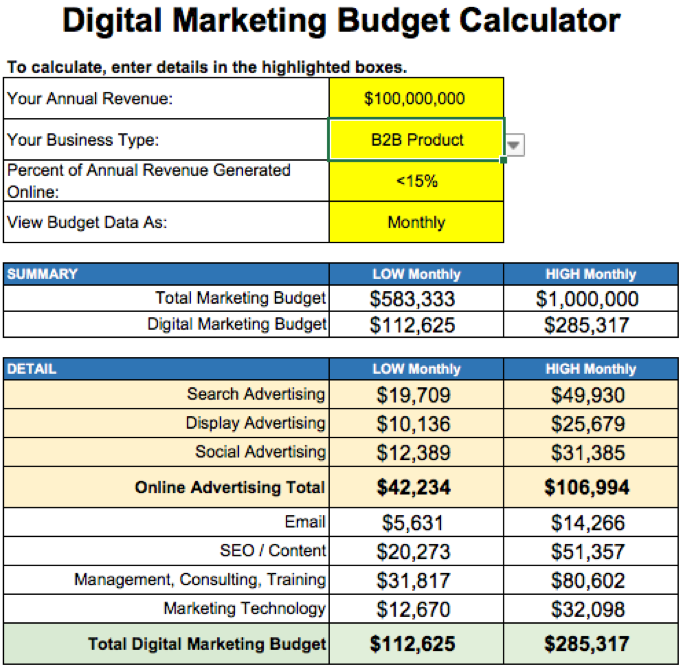 By combining these resources, Chris and his team have formed an accurate representation of a monthly marketing spend. We tested it with one of our clients that’s on a monthly retainer with Splendor and the suggested spend was spot on. This accuracy prompted me to share the article. For Percentage of Annual Revenue Generated Online, the options are 0%, less than 15% or greater than 15%. We decided middle of the road, less than 15% would be the most realistic to encompass the low range in generated revenue. 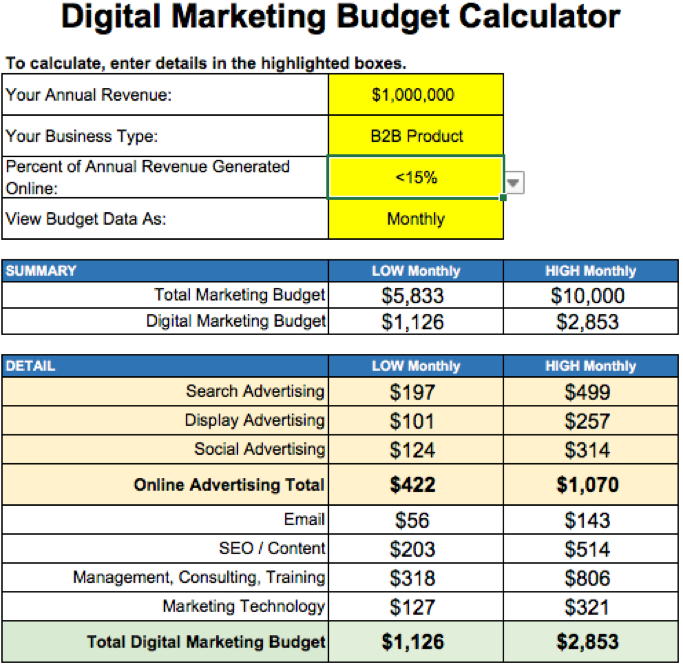 If you’re a small business with an annual revenue of ~$1,000,000 that wants to grow– the calculator suggests spending ~$5,000-$10,000 monthly on your total marketing budget. Congratulations!! You’ve broken an annual revenue of $100 million dollars. But it’s no time to sleep. Companies like Apple and Nike (while earning just slightly more than $100 million/year) are at the top of their game yet they continue to invest heavily in marketing. If you invest $12,000,000 a year (!! ), or 12% of your annual revenue, you’ve guaranteed your company a ROI. 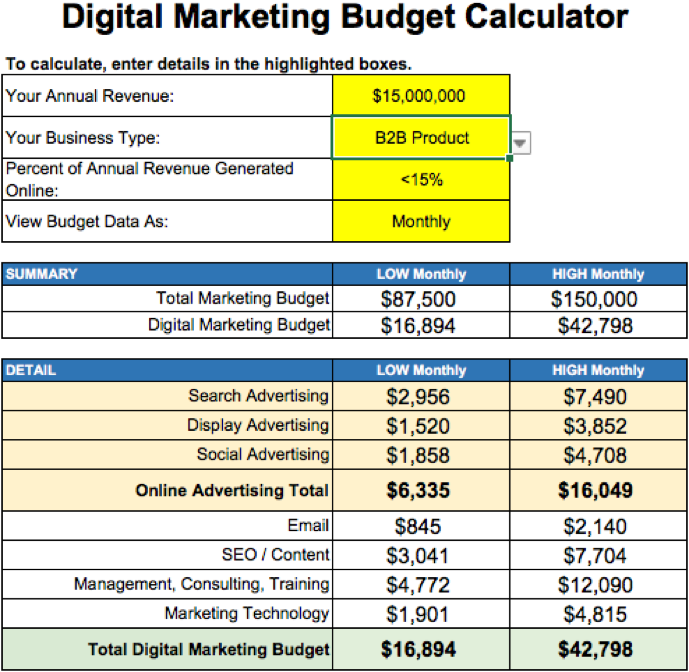 If your company has decided to set up a marketing budget for FY18, this tool is a must have. There’s a reason big, successful companies invest in marketing; because it works. Any company at any size can benefit from a successful, strategic marketing plan. And Splendor can help implement it. Splendor Design Group believes an educated client is our best client. Stay tuned to our blog for insight in the world of everything design, web, and digital media. Have something to add? Connect with us on social media – we’d love to hear from you (links to the right). 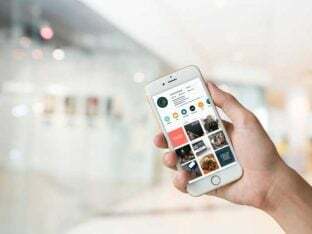 Instagram marketing is changing the game. Here’s 6 reasons why! Your site’s landing page should make a strong impression on visitors to entice action. 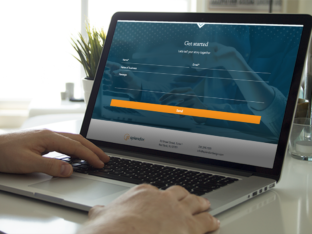 Here are 7 ways to create a more user-centered landing page to increase your conversions! 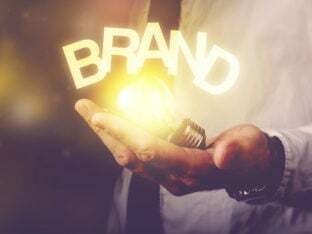 Branding is essential for any marketing campaign. Make sure your branding is perceived in the best light possible by taking control with these key elements!